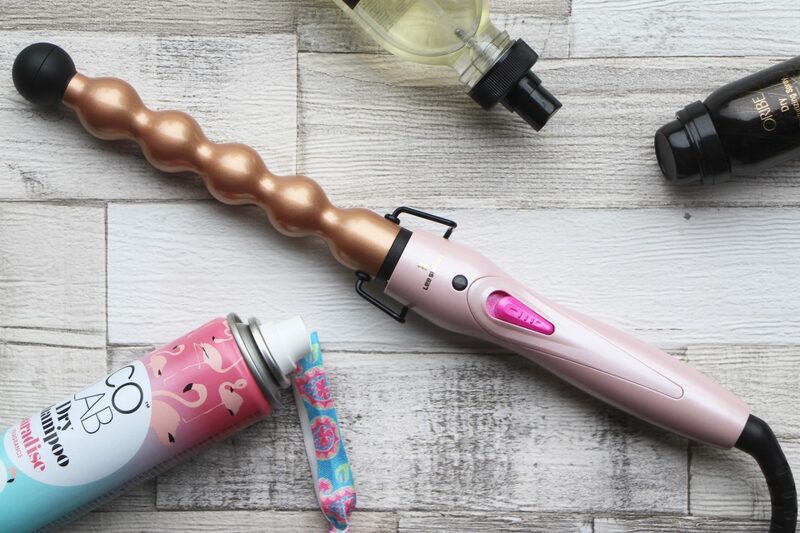 Lee Stafford’s quite rude-looking CoCo LoCo Wonderball Ceramic Hair Waver has instantly shot to the top of my “best hair things” list. It’s so easy to use that I managed to wave my hair without using a mirror. That’s right, readers: I curled my hair using blind faith and the tiny flip-out screen of my camera, which was positioned approximately eight thousand metres away. And to put things in perspective here, I usually need not only a mirror but a chair to sit on (my arms get tired), some sort of surface to rest the heated appliance on (for when I’m faffing about trying to section off pieces of hair to curl) and a bucket of water for when I set fire to my own head. Usually, I grunt and swear whilst I try to work out which hand the heatproof glove needs to go on, then I grunt and swear again as each and every strand of hair that I try to curl slides straight off the end of the curling tong or wand. Which is why – and you’ll know this if you’ve followed my idiotic rantings for any length of time – I prefer wands with balls. Bobbly wands. Whatever you want to call them: they’re not straight. Why make life difficult for yourself, when you’re already risking third degree burns to the tops of your ears and slowly melting your manicure to the inside of a sweaty glove? Why not wrap your locks around something that grips onto them and gives you a proper curl within seconds? Anyway: the Wonderball Hair Waver*. Quick to heat up and there’s just one switch – the on switch. No heat settings, it just blasts right up there to 200 degrees. Which is usually what I set my tongs to anyway. I don’t need choices when it comes to hair appliances. Don’t start giving me decisions to make when I’m wielding a hot tool. Actually, Lee Stafford makes another bobbly rod, this one called the Rainbow Shine Waver Wand*. It’s £39.99 and does come with a fancy glove. It also has a thicker shaft (! ), which could work better for you if you want either looser curls or have longer hair. The CoCo LoCo works well for my shorter hair, but I’m always up for a bit of experimentation so perhaps I’ll give the big one a go. 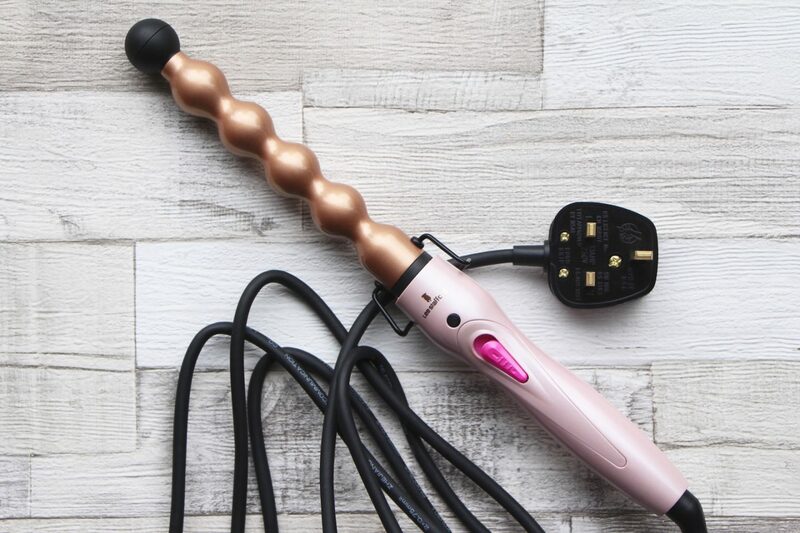 I’ve filmed myself using the Wonderball Waver, so I’ll pop that up soon, but it really is as simple as grasping sections of hair and winding them around the length of the wand. I keep the sections of hair in place for around fifteen to twenty seconds and then release. It’s important, I think, not to touch the hair as it cools. Don’t make the mistake of sort of stretching the hair from the barrel, or pulling it away; just let it fall off in a spiral and then leave it until it’s totally cool. I’ve obviously ruffled it around a bit and there’s some dry shampoo in the roots, but they’re nice curls, don’t you think? Top marks for this waving wand – if I can use it, almost anyone can. The Lee Stafford Wonderball Waving Wand is £27.99 at Amazon here*. You can about my newer, shorter haircut here and if you haven’t already entered my amazing hair overhaul giveaway then do it, do it now! Entries must be in before noon on Friday the 11th August.